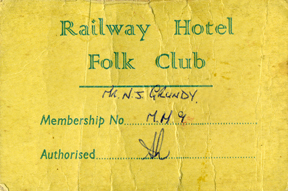 4th August 2003 saw the final night of the Railway Folk Club, after more than 40 years. Graham Plater opened the club at the Railway Hotel, Fratton, on Monday nights in 1965 following the demise of Ted Wenham's club (started in October 1961?) Which had run on Tuesday nights at the Cobden Arms in Arundel Street (but not called the Railway). The railway is one of the few clubs in the country to have maintained a policy of a guest night every week. Sooty's predecessors running the club: Graham Plater (not Platter); John Bristow ; John Harvey, and Dave Keast, finally it was taken over by Sooty Broughton who has been running it since 1968. The club had various venues, the Railway Hotel, Fratton ( for the first 20 years), The King's Hotel, Albert Road, The Horseshoe, King's Road, The Festing Hotel, Festing Road, The Hornpipe Theatre, Kingston Road, The Railway Social Club (round the corner from the Railway Hotel), The Alma Arms, Highland Road. The information above comes from a site that was last updated in August 2005, http://www.users.waitrose.com/~pjntrish/railway-folk-club.doc-(2)/railway-folk-club.htm There is a comprehensive list of those who performed at the club on the site.